In A.D. 313 the Roman Emperor Constantine appealed to popular pressure and issued the Edict of Milan, which legalized Christianity. Before then, people worshipped Zeus, Apollo, Aphrodite, and other Greek and Roman gods. Constantine also decided the Roman Empire was too big to govern from a single capital, so he founded another capital further East in Istanbul, and named it after himself: Constantinople, which means "Constantine City." Soon, the Roman Empire started to split into two parts: the Latin speaking Western Empire governed from Rome, and the Greek speaking Eastern Empire governed from Constantinople. In A.D. 476 the Western Empire collapsed, leaving only barbarian tribes, and the Pope in Rome as it's spiritual head. The Eastern Empire continued to flourish, with the Eastern Roman Emperor as its temporal head and Constantinople as its spiritual head. In A.D. 1056 the estrangement between the Western and Eastern Empires became so immense they excommunicated each other in a move known as the Great Schism, creating the Roman Catholic Church in the West, and the Eastern Orthodox Church in the East. In 1517 Professor Martin Luther published his Ninety-five Theses, followed by the New Testament in 1522, followed by the complete Bible in 1534, starting the Protestant Reformation movement where religious believers, due to errors in theology and abuse of pay-for-repentance, discounted the claims of the Catholic Church and it's Priesthood Papal authority being the only source of forgiveness of sin and access into Heaven. Other famous ministers such as John Calvin furthered this movement which reached a climax in 1618 when Ferdinand II became ruler of what was left of the Holy Roman Empire and forced Catholicism on everyone. This triggered the Thirty Years War in Europe in which Catholics and Protestants fought each other creating one of the most destructive battles in human history, ending the lives of over 8 million people. Protestantism was here to stay. In 1648 the war ended with the Peace Treaty of Westphalia, which created an international agreement for co-existing sovereign states, which would eventually inspire the formation of the League of Nations after WWI, and later, the United Nations. Several waves of religious enthusiasm triggered by evangelical Protestant ministers occurred within the United States starting in the early 18th century. • First Great Awakening: 1730-1743 occurred in Georgia, New England, and Eastern Canada. Preachers evolved from reading talks to involving the audience in sermons. John Wesley organized the Methodist movement which emphasized personal accountability over predestination, discipleship, and religious instruction along with worship. • Third Great Awakening: 1850-1900 was characterized by new denominations, active missionary work, and an appeal for religious answers to social issues. • Fourth Great Awakening: 1960-1970 conservative religious groups gain political power, while mainline protestant denominations weaken. The Pilgrims arrived to Plymoth, Mass. in 1620, and were the second successful English colony, after Jamestown, VA. Pilgrims were orignially English but fled to the Netherlands to escape the English state church after it was severed from mainstream Catholocism in 1534 by Henry VIII. Eventually they left the Netherlands and founded New England to preserve their English Identity in the New World. They were noteworthy because they prefered to follow religious leaders over Bible dogma, which created a platform for Mormonism. The Puritans were reformed protestants who saught to further purify the Church of England from it's Catholic practices. Led by educated Bible scholors, they emphasized 100% focus on the Bible. Between 1630-1640 many puritans immigrated to America. Eleazar Wheelock, a minister participating in the First Great Awakening, befriends a local native, educates him, and converts him to Christianity. Using funds and donated land from a friend, Colonel Joshua Moor, Wheelock opens Moor's Indian Charity School in 1754, a free school for Native American children to become educated and Christianized. His model was so successful, he was able to raise funds back in England to expand his school in New England. Moor's Charity School was located only several miles north of Joseph Smith's family home, and was attended by Hyrum Smith, Joseph Smith's brother, intermittently between 1811-1816. Using funds from his many contributors in England including King George III, and William Earl of Dartmouth, Eleazer founds Dartmouth College in 1771. Dartmouth's charter reads that it was founded to aid the native peoples by "spreading the knowledge of the Great Redeemer among their Savage Tribes." John Smith was a minister, and in 1777 became the first professor at Dartmouth College, working with founder Eleazer Wheelock. He was trained in the Ministry by Reverend Samuel Moody, Headmaster at Dummer Academy in Byefield, who participated in the Protestant Great Awakening and was quoted as saying "The Sword of the Lord and of Gideon" while attacking a French Catholic church alter with an axe. John Smith studied Greek, Latin, Hebrew, Chaldaic, and Arabic, and taught many religious concepts, including the idea that native Americans might have originally come from Israel. Solomon Spalding, Ethan Smith, and Stephen Burroughs were all classmates togther at Dartmouth studying under Professor John Smith. Spalding and Smith graduated from Dartmouth. Both authors wrote works furthering Professor John Smith's ideas, all of which predate the Book of Mormon. Solomon Spalding wrote "Manuscript Found" which has often been cited as the source of, or inspiration for the Book of Mormon. Ethan Smith wrote "A View of the Hebrews" which contains so many similar elements to the Book of Mormon that B.H. Roberts, president of the Quorum of the 70's in 1921, presented these similarities to the Quorum of the 12 Apostles wanting an explanation and got shut down. Ethan Smith became Oliver Cowdrey's pastor. Oliver and Joseph Smith were distant cousins. Stephen Burroughs went on to become the most prominent conterfeter in New England, and was called by some the worst crook in Colonial America. He fled to Canada, manufactured lots of fake New England currency and wrote a book about it, called "Memiors" which later became a best-seller and a favorite book of Joseph Smith. Note that Dartmouth College was chartered to bring Christianity to the native Americans, which is the premise of the Book of Mormon. By the early 1800's an anti-establishment culture was prevelant in New England. America had won it's independence from the English crown fifty years ago. Protestantism was thriving in New England in defiance of the ancient Catholic church. All of this combined with Pirate stories of Captian Kidd, folk-magic, and travelling ministers bred a culture of counterfitting, money-digging, and secret organizations. The Jan 17,1825 Vermony's Windsor Journal complained that "even the frightful stories of money being hid under the surface of the earth, and enchanted by the Devil, or Robert Kidd, are received by many of our respectable fellow citizens as truths." Cunterfitters such as Stephen Burroughs learned they could pose as travelling ministers, growing large networks of collaborators and dissimanting fake currency all over a region. Money-digging scams emereged where people using folk-magic claimed they could use divining rods, or peepstones to find buried pirate treasure, and needed investment money to dig deep holes. Of course, the supposed treasure could never be found. Glass-looking scams emerged where a missing horse or wallet could be stolen and then magically recovered for a price by a glass-looking indivdiual looking at a peepstone. Joseph Smith Sr. was named in at least two different counterfitting court trials as someone passing fake bills. Ninty year old Laban Clark exposed a counterfitting ring he claimed involved the same group that later started Mormonism. It's interesting to note the character Laban in the Book of Mormon got decapitated. Joseph Smith Jr. particularly enjoyed reading about Captain Kidd's adventures in a town called Moroni in the Comoro Islands. An 1808 map of Africa refered to the Islands as "Camora." Joseph Smith's family lived in the woods near Palmyra, NY in the early 1800s. His father was a school teacher sometimes. His brother Hyrum was sent to Moor's Charity School, a private academy associated with Dartmouth, and eventually became a school teacher. The Smith family learned to read using the Bible, as was common at the time. Joseph Smith Sr, and Oliver Cowdrey's Father were part of a money-digging order called the Wood Scrape group. According to James C. Brewster, in 1837 Joseph Smith Sr. said, "I know more about money digging, than any man in this generation, for I have been in the business more than thirty years." Joseph Smith Sr. was a drunkard and a gambler and although he belived in Universalism, he prohibited his Presbyterian wife from attending any organized church for the first part of their marriage. Joseph's family was forced to give up their land several times due to backruptcy. Joseph Smith neighbor Sally Chase used a peepstone to "see things" nobody else could see. Joseph Smith started collecting several of his own as a young boy. Joseph Smith is exposed to a number of books of his time containing storylines about Jewish people traveling the seas and landing in the America's, becoming the ancestors of modern day Native Americans. In 1823, Joseph Smith begins entertaining his family regularly during dinner, telling stories of ancient inhabitants of the Americas, given to him from private conversations with an angel, he claims. Six years later he will reveal and publish the Book of Mormon, a history of Jewish people who fled Jerusalem and traveled to the Americas, and are supposedly the ancestors of modern-day Native Americans. "You have stolen my daughter and married her. I had much rather have followed her to her grave. You spend your time in digging for money -- pretend to see in a stone, and thus try to deceive people." Joseph wept, and acknowledged he could not see in a stone now, nor never could; and that his former pretensions in that respect, were all false. He then promised to give up his old habits of digging for money and looking into stones". After 3 years (1830) Joseph and Emma move, publish the Book of Mormon, and start the Mormonite church. Emma never sees her parents again. Martin Harris, a wealthy, simple, religious farmer is pressured into mortgaging his farm to provide money for Joseph Smith to print the Book of Mormon. In Feb 1828 Harris takes characters written on paper by Joseph Smith to a local professor named Charles Anthon, to be authenticed. The characters were very simiar to the Detroid Manuscript found or fabricated by Joseph Smith's uncle. Further reserach shows the Detroit Manuscript to be a fabricated collage of 17'th century shorthand. Harris reports professor Anthon rejects the characters, demanding to see the ancient plates they were written on. When Harris explains Joseph is not showing them to anyone Anthon says "I cannot read a sealed book," which is a reference to fulfilling prophesy in Isaiah 29:11. Later, when the Joseph Smith Papers were published, the statement "I cannot read a sealed book" has clearly been inserted into Harris's historical document. The Book of Mormon is published in 1830, being "the most correct of any book on earth" and containing the "fullness of the Gospel," being written specifically to "... the Lamanites, and they are the principle ancestors of the American Indians." In 2006 the church changed this definition. Despite having the fullness of the gospel, the book contained no information about Priesthood Ordination, Temple Endowments, Temple Marriage, Eternal Families, Calling and Elections, Saving Ordinances for the Dead, Tithing, Eternal Progression, Embodiment of God, 3 Degrees of Glory, or the Plurality of Gods. Despite being the most correct book on Earth, over 3900 corrections have been made to it. Some significantly changing the doctrine. DNA Testing has confirmed the people of Central and South America are not Lamanites. Currently, the church cannot find any Lamanites, which has immense implications on generations of Native Americans who were raised thinking they were descendants of the Lamanites. More here. The first edition of the Book of Mormon, as well as Joseph Smith's first account of the First Vision indicated that Jesus and Heavenly Father were the same person. Both, later editions of the Book of Mormon, and later accounts of the First Vision say they are separate personages. April 6, 1830, one month after publishing the Book of Mormon, Joseph Smith forms the church in Fayette, NY. In September of that year, Parley P. Pratt is baptised, after having been given a Book of Mormon by a baptist deacon. Parley was a parishoner of Sidney Rigdon, and introduced Sidney to the Book of Mormon. In November of that year, Sidney Rigdon--a Baptist minister with 10 years of experience--joins the church and within three weeks converts his enitre parish. This boost, and Rigdon's continuous preaching, creates a surge of church membership in Kirtland greater than in Fayette, where Joseph was. Joseph Smith requires tithing of 2 percent of all one possesses, after deducting depts, to become a Mormonite. In 1838, it was redefined as members needing to give "all their surplus property to the church" and thereafter pay "one tenth of all their interest annually." This means 1/10 annual interest (6%) on your net worth. So, if your net worth was $100,000 then tithing would be $6,000 * (1/10), or $600 each year. In 1844, immediately after Joseph Smith's death, the church redefined tithing to be 10% of your annual income. If your annual income is $100,000, you must pay the church $10,000 each year. Joseph Smith exempted himself from paying tithing until his debts were paid off. The first missionaies are called to preach to the Lamanites. More here. More here. Religious tracts were printed and sent to different nearby towns. Early church missionaries taught that the Second Coming of Christ was near--within 4 years hence. Therefore, if you didn't join the Mormon church right now, Jesus was going to come soon and burn you and your family, and give all of your property to faithful Mormons. Martin Harris even publically promises to cut his own hand off if Jesus does not show up within 4 years. Soon after telling everyone Jesus would return four years hence and burn all the non-believers, Joseph Smith receives a revelation the church needs to move to Kirtland, OH, where it was growing the fastest thanks to Sidney Rigdon's ministry. Along with Kirtland, OH, the church starts growing in Far West and Independence, MO. Joseph & Emma leave in 1831 for Kirtland. The remaining saints leave in 1832. In 1831 Joseph and Emma move to Kirtland. Some of Sidney Rigdon's church congretation were practicing communal living on Isaac Morely's farm in Kirtland OH before joining the Mormonites. On Feb 4, 1831 Joseph received a revelation calling Edward Partridge to be the first bishop of the church. Five days later, on Feb 9, 1831, Joseph received another revelation detailing the Law of Consecration. This new revelation directed the Latter Day Saints to impart their land and money to the church, and was intended to be "an everlasting order for the benefit of my church, and for the salvation of men until I come." As members joined the order, they were given new names. Members begin formally practicing a United Order for a short time. but Joseph soon looses interest in the concept because it attracts too many empoverished saints, and Joseph wanted to collect money, not spend it. Also, people sqabbled over property, and assets. Some saints sized up the church as a fraud, and left, losing everything. In 1831 Joseph and Emma move to Kirtland. Joseph is soon caught by his wife Emma, having a "transaction" alone in a barn with young housemaid Fanny Alger. Joseph explains to Emma that an angel from God commanded him with a flaming sword he must take a second wife and begin the practice of Polygamy. Joseph later marries Fanny in 1833. Emma eventually throws Fanny out of the house "in the night". On March 24, 1832 an angry mob of men frustrated with Joseph's sexual advances upon the community and particularly Eli Johnsons's 16 year old sister Nancy Marinda, break into his house with a local physician in an attempt to castrate him. The physician backs out at the last minute, and the mob resorts just to tarring and feathering him. More here and here. Marinda Johnson marries Orson Hyde on Sept 4 1834. Joseph Smith later sends Orson on a mission and while he is gone marries Marinda as one of his plural wives in April 1842. One month after Joseph was tarred and feathered, Brigham Young is baptised into the church (April 15, 1832) and moves to Kirtland. Brigham was introduced to the church by his three older brothers who all joined the church first: Phineas, John, and Joseph Young, who were given a Book of Mormon by Samual H. Smith, Joseph's younger brother. Phineas Young was married to Oliver Cowdrey's half-sister. Joseph Smith purchases four Egyptian mummies and at least five papyrus documents dicovered near Thebes by Antonio Lebolo between 1818 and 1822, from a travelling visitor for $2,400 (~ $58,000 in 2018). In Oct 1835 he begins working with Oliver Cowdrey to translate an alphabet to the Book of Abraham, and arranging Egyptian grammer. In Nov 1835 he begins translating what he called the "Book of Abraham" which was published in 1842, and became LDS Cannon in 1880. The Book of Abraham contains information Abraham in the Old Testament supposedely received about the universe. After Joseph Smith's death, the Egyptian artifacts remained in the possession of the Smith family, and eventualy made their way to the Chicago Museum, and the New York Metropolitan Museum of Art. The Chicago relices were destroyed in the Great Chicago Filre of 1871, but in May of 1966 Aziz S. Atiya, a coptic scholar from the University of Utah, found the New York fragments. The church purchased them on Nov 27, 1967. Meanwhile, due to the Rosetta Stone being found in 1799, scholars were able to slowly piece together the Egyptian language. Non-LDS Egyptian scholars have dismissed the Book of Abraham as a complete fabrication and not a reflection of the fragments. Professor John Smith's writings about the universe seem to be a direct source for the contents found within the Book of Abraham. Joseph's Mom charged visitors $.25 to see the mummies. The Book of Mormon seemed to clear up questions from the New Testament. The Temple was created to clear up questions from the Old Testament. The ceremony itself is much like the masonc temple ceremony. The church's first temple is built in Kirtland, OH in 1836, and is shaped like a bricked-school house. After constant persecution, later temples would be designed as fortresses, having cannon proof walls, windows situated for aiming cannon barrels, and a balustrade across the top for riflemen defenses. Moses, Elias, Elijah, and Jesus all appear in this temple, according to Joseph Smith. Joseph Smith Starts a Bank, Which Fails. On April 3, 1836, Jesus Christ, Moses, Elias, and Elijah appear in the temple to Joseph Smith and Oliver Cowdrey and convey priesthood keys for the gathering of Israel and the leading the Ten Tribes from the North. Joseph Smith starts an anti-bank called "The Kirtland Safety Society" in 1836 because Ohio does not allow any new bank charters. Bank officer William Parash quotes Joseph Smith as having said that an "audible voice of God" told him to. The voice said this bank "like Aaron's rod shall swallow up all other banks...and grow and flourish and spread from the rivers to the ends of the Earth, and survive when all others should be laid in ruins." One year later, the Summer of 1837, the bank fails. Joseph Smith's church is in serious debt and collectors seek legal action. Many sants leave the church claiming that Joseph was simply lining his own pockets. Apostle Heber C. Kimball later said the bank crisis was so shattering that "there were not twenty persons on earth that would declare that Joseph Smith was a prophet of God." Ex-saints call remaining saints "Pot-lickers." On March 25, 1838, Martin Harris states in public the three witnesses never saw or touched the plates with their real hands or eyes, but that they saw them spiritually, not physically. Between the bank failure and this statement, four apostles and hundreds of saints quit the church. Oliver Cowdery (primary scribe for the Book of Mormon translation process) & David Whitmer (Oliver's Brother-in-law) are excommunicated. Oliver because he suggested Joseph Smith had committed adultery with Fanny Alger. David because many remaining saints wanted him to run the church. Apostle Lyman E. Johnson was disfellowshipped, and John Whitmer, Hiram Page, and W.W. Phelps (President of the church in Far West) were excommunicated for similar reasons. Oliver joins the Methodists, but 10 years later returns to Mormonism. Some of these saints move south, to Liberty, MO. Pressure mounting from the failed bank investors, and men upset with Joseph's sexual advances towards their wives and daughters force him to leave Kirtland--literally in the night. This happened in December 1837. Joseph Smith and Sidney Rigdon flee to Far West, MO. Brigham Young, is pressured by ex-saints for continuing to publically support Joseph, and a short time later flees to what would become Nauvoo, IL. In 1830 a revelation reveals that Independence Missouri is the center of Zion. Some saints start moving there in 1831. Joseph Smith dedicates a temple site in August, 1831. Temple construction begins in 1833. Saints approach locals, telling them the 2nd coming of Christ is going to happen within a few years, and that their land will be given to the saints by God, whether they like it or not. The effect was accelerated because W. W. Phelps had a printing press and these messages were spreading far and wide quickly. July 20, 1833, an angry mob destroyed W. W. Phelp's printing office and house, scattering what was to be known as the Book of Commandments, and an early collection of Joseph Smith's teachings and prophesies. Most of these documents were recovered and printed in a later text known today as the Doctrine & Covenants. Bishop Edward Partridge and Charles Allen are tarred and feathered. Three days after the printing press is burned down, the saints collectively agree to leave Independence. They depart in 1833 and head into nearby counties, including what would become Far West. The Church in Far West, MO. Far West was founded by the saints in August 1836, and a temple site was dedicated in 1838, but never constructed. Sidney Rigdon is given charge over the church in this area. Joseph Smith and Sidney Rigdon demand a salary of $1200 per year from the saints, and encourage them to acquire land for farming from the existing gentiles. The Mormons start telling the locals that God has given them Missouri and they will eventually have to give up their lands, willing or not, and they begin refusing to make payments to the locals. They also continue preaching that Jesus will arrive soon (2nd Coming) and destroy anyone who is not converted to Mormonism. In addition, the many of the church leaders excommunicated from Kirtland settle nearby and warn the locals the Mormons have taken all of their land and property, and the secret Mormon Danites were planning to burn nearby Richmond and LIberty to the ground. This enrages the locals and leads to small skirmishes like the battle of Crooked River, and the Haun's Mill Massacre. In June of 1838, an unofficial underground group of saints led by Samspson Avard create the Danites, or "destroying angels," a vigilante group devoted to enforcing the prophet's will by violence, if necessary. Famous Danites include Porter Rockwell, and John D. Lee. After the famous July 4, 1838 "Salt Sermon" given by Signey Rigdon denouncing the excommunicated church leaders in Kirtland, the Danites send a threatening letter to them telling them to permanently get out of town. Joseph Smith soon denounces the group as "frauds and secret abominations" and Sampson later became a chief witness against Joseph Smith during his incarceration, saying he was the mastermind behind the Danites. Signey Rigden announces a "War of Extermination"
During the cornerstone laying ceremony for the future Far West temple, on July 4, 1838, Sidney Rigden, then President of the church in Far West gives his famous Independence Day speech, also know as the "Salt Sermon." He says, "And that mob that comes on us to disturb us, it shall be between us and them a war of extermination; for we will follow them until the last drop of their blood is spilled; or else they will have to exterminate us, for we will carry the seat of war to their own houses and their own families, and one party or the other shall be utterly destroyed...". Due to increasing pressure from non Mormons from skirmishes with Mormons, and triggered by Signey Rigdon's comments in his July 4th public speech, on October 27, 1838 Missouri Governor Lilburn W. Boggs issues Missouri Executive Order 44 to rid the state of Mormons. He declared, "The Mormons must be treated as enemies, and must be exterminated or driven from the State if necessary, for the public peace." Joseph Smith, Sidney Rigdon and many others to go Jail. As a result of the Battle of Crooked River and previous mounting concerns, the governor sends 1200 troops to rid Missouri of Mormons. Joseph Smith surrenders, in what becomes known as the "Treaty of Far West." December 1, 1829, he and many remaining leaders are imprisoned in Richmond Jail, and later Liberty Jail, where they remain for 6 months. They are eventually let go on the condition that all the saints agree to leave Missouri. Brigham Young runs the church from Nauvoo, during this time. As a result of the Missouri Executive Order 44, and the skirmishes that erupted, almost all of the saints are forced to leave Illinois, and flee to Nauvoo in 1838. For the next 137 years, it was surprisingly legal to kill a Mormon in the State of Missouri. This law was rescinded by Governor Bond in 1975. The Church in Nauvoo, Il. It's 1838. Since most of the church leadership had quit or been excommunicated, Joseph remains as Prophet, and Hyrum takes over as assistant president of the church. Having been shot at during several skirmishes in Kirkland, and having to flee Kirtland by night, Joseph Smith commissions the next temple--the Nauvoo temple--to be designed as a fortress. Dedicated in 1846, it had 4 to 6 feet thick granite walls, capable of withstanding cannonballs, and the windows doubled for cannon barrel eyelets. The top of the temple had an ornate balustrade, capable of hiding an army of riflemen in shooting positions, if needed. Although Joseph Smith was martyred before the temple was completed, the saints quickly finished it upon his death. You'll note that the Salt Lake Temple is an improvement on this idea. Six spires with three levels of battlements each, with connecting railings provided hundreds of riflemen positions, if needed. Horizontal shafts were part of the original construction, which could move cannons up and down quickly. Those shafts were eventually converted into elevators. Although Joseph Smith started polygamy in Kirtland, in 1833, he became aggressive with it from 1838-1844. He makes advances on many women, and marries any of them who would consent...both single and married. Of those women who would not consent he claims he was "testing them." He promises eternal life to those who marry him. Sometimes, he would send men on missions and then marry himself to their wives. Historians aren't sure on the total count, but he had married at least 27 women. Despite this behavior, he preached against polygamy publicly. Orson Pratt's wife who opposed polygamy describes why it was practiced privately, but preached against in public. John C. Bennet, a physician who was skilled in the practice of abortion, arrived on the scene in Nauvoo in 1840 and on April 7, 1841 became a counselor in the First Presidency. He had a reputation for having his own girlfriends. He was rumored to perform abortions for his girlfriends and Joseph's wives, when needed. Nauvoo grows within a few short years from a population of 100 to 27,000 to become the largest city in Illinois. Joseph Smith, by being both mayor and church President, wields awesome power and can approve or deny any significant business deal within his area. In 1843, six small metal plates with strange engravings are found by local townspeople in an American Indian burial mound in Kinderhook, Illinois. The plates are taken to Joseph Smith who says the engravings were similar to those found on the golden plates. He proceeds to translate stating the Kinderhook plates told a story about an ancient Jaredite who was a decendant of Ham. Joseph died before he was able to produce a complete translation of the plates. Wilbur Fugate, years later, told everyone it was a hoax and he had created and planted the plates. In 1980, electronic and chemical analysis resolved that a remaining plate #5 was produced in the 1800's in a manner consistent with what Wilbur Fugate reported. Emma, who cannot stand polygamy, but has no choice in the matter, resorts to poisoning Joseph. He records in his journal this was her second attempt at poisoning him. We know this because Brigham Young talked about it in the October 1866 General Conference. Joseph joins the Masons in the early 1840's and copies the Masonic temple ceremony, giving it to the Mormons. This is a Masonic death-oath violation. Hyrum had already been a member of the Masons for some time. Incidentally, the first five presidents of the church were Masons: Joseph Smith, Brigham Young, John Taylor, Wilford Woodruff, and Lorenzo Snow. Joseph creates a secret Council of the 50, and makes plans to overthrow the governments of the world. He starts organizing with the local Indians for the purpose of taking over the US Government. He intends to crown himself King after the overthrow, and has the council vote him in as King for now. He instructs the secret council to refer to him as "the source" until the church is powerful enough to defend the kingdom. A small group of devoted saints who dislike polygamy splinter off and create their own church. Eventually they purchase a printing press and begin printing news about Joseph Smith's secret polygamy and plans to overthrow the government of the US. Joseph Smith orders his men to destroy the printing press before the first edition of the Nauvoo expositor can be printed, exposing his plans. Joseph Smith is wanted for destroying the printing press, in 1844. He flees across the Mississippi, but his wife convinces him to go and back and face justice. "The saints think you are a coward." He says, "I am going like a lamb to the slaughter, but I am as calm as a summer's morning I have a conscience void of offense towards God and toward all men." He returns to Nauvoo and turns himself in. All charges are formally dropped except for Joseph Smith being tried for Treason. John Taylor recalls Joseph, Hyrum, and himself drinking wine together while incarcerated. Then he sings "A Poor Wayfaring Man of Grief." A pistol is smuggled in, and an angry mob forms outside the jail house. Consequently, a shootout ensues. Joseph exchanges gunfire with the mob but he and Hyrum are killed. 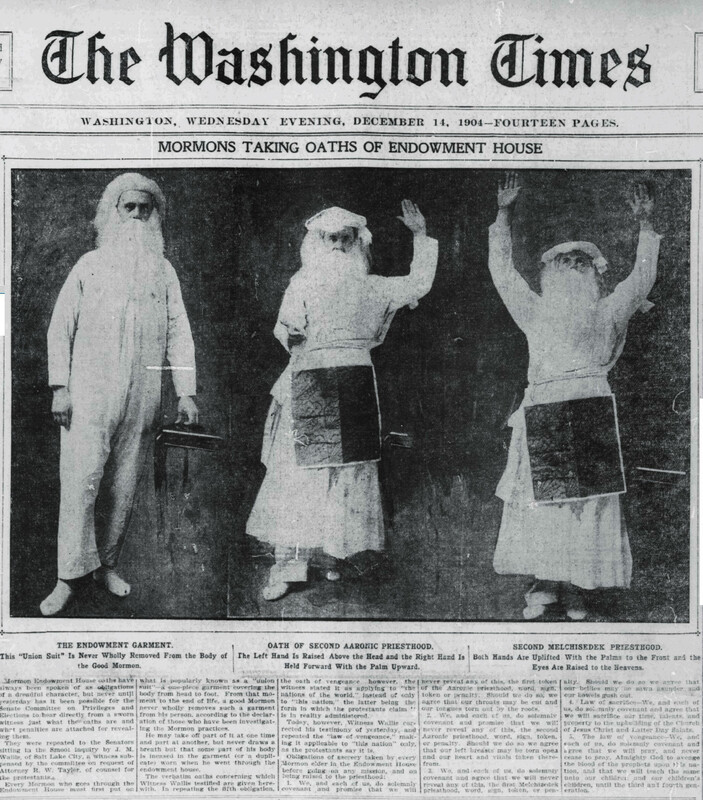 The mob was compriseed of one to two hunderd masons from the nearby Warsaw lodge with disguised faces who where applying the death oath violation upon Joseph Smith for copying the secret Masonic temple ceremony and creating the Mormon temple ceremony with it, effectively divulging it to outsiders. In addition, there were now more Mormon Masons in Nauvoo than in the rest of the state and this was starting to sway elections. Five masons are tried by acquited for Joseph Smith's death. After the trial they are all prompty promoted within their lodge. According to William Clayton's journal, Samuel Smith was to be appointed to head the church if Joseph and Hyrum did not return from Carthage. Within one month of their deaths at Carthage, Samuel Smith is poisoned to death. William Smith (brother to Samuel and Joseph, and an apostle later excommunicated by Brigham Young) wrote this in a 28 May 1857 New York Tribune article exposing Brigham Young and the secret Danite Order oath and intentions: "I have good reason for believing that my brother Samuel H. Smith, died of poison at Nauvoo, administered by order of Brigham Young and Willard Richards, only a few weeks subsequent to the unlawful murder of my other brothers, Joseph and Hiram Smith, while incarcerated in Carthage jail." Samuel's wife Levira reported of his death: "[He] spit it out and said he was poisoned. But it was too late-he died." Brigham denied these claims but then assumed the seat of the presidency, including receiving all church assets, all future tithing proceeds, Josephs wives, and 27,000 followers. An Aug 2008 Ensign article about Samuel Smith obfuscates all of this. In 1845, after Joseph Smith's death, James J. Strang emerged, having been visited by an angel. He claimed the angel called him to take over where Joseph Smith left off. He uncovered another set of plates buried in the ground, which he claimed were the original plates of Laban. He claimed to have translated them into a 320 page book, using a peep stone, into what is now called the The Book of the Law of the Lord. Samuel Graham was his scribe during the translation process. Seven witnesses claimed to have seen and handled Strang's plates. Strange was endorsed and followed by Joseph Smiths parents, brothers, sisters, Hyrum Page, the Whitmers, Oliver Cowdrey's father, and many other saints. This list includes all of the remaining living witnesses of the Book of Mormon plates, except Oliver Cowdrey himself. Emma Follows Joseph Smith III. Following a nasty legal dispute with Brigham Young regarding the splitting of church assets, Emma and her son (who had been promised in a blessing to become the prophet and leader of the church one day) created the Reorganized Church of Jesus Christ of Latter-day Saints. Emma writes a letter to the Mississippi Democrat newspaper, calling the new church leadership under Brigham Young "tyrants" and saying her husband had a "diseased mind." The RLDS church is now called the Community of Christ. The majority of saints follow Brigham Young. He leads them to Utah, continuing the practice of Polygamy. He marries many of Joseph Smiths' wives to himself. Boxes of church documents and journals are carted across the plains. Brigham Young oversees the establishment of the settlements of the Saints in Utah, including the construction of the Salt Lake City temple. He owns all of the land and gives portions away to incoming saints. In 1849, Brigham Young sends missionaries to California to dig for gold, keeps much if it for himself. Personally becomes one of Americas first millionaires. Some of his wives complain about being poor despite his wealth. On May 13, 1857 Parley P. Pratt was shot six times and stabbed twice by Hector McClean, estranged husband of Eleanor McClean. Parley met up with Eleanor in Van Buren, AK to take her back to Utah to become his 12th wife. He had met her 3 years earlier. In September of 1857 settlers from the Baker-Fancher wagon train travel through southern Utah on their way to California. They brag about having some in their party who Killed the Prophet Joseph. Brigham Young and John D. Lee command over 70 mormon men to execute the temple oath to avenge the death of the Prophet Joseph, and murder all the traveling adult men and women. Pioneer journals indicate the settlers were first disarmed and promised safe passage. Skulls dug up on the mound nearby indicate the travelers were shot in the face. The Mormons kept the small children and raised them as Mormons. This event became known as the Mountain Meadows Massacre. Brigham Young, while visiting the site in 1861, said "Vengeance is mine and I have taken a little." accordinng to Wilford Woodruff's diary. This comment referred to the Mormon Temple oath for which every temple member was bound, to take vengence upon the prophet Joseph's death. This oath was removed from the temple ceremony around 1930. More here. The church as since issued a formal apology. An August 1877, Brigham Young had ordained three of his sons to become Apostles in the Church, including John Willard Young who was age 11. Later that month, and weeks before the October 1877 General Conference, Brigham Young mysteriously dies from what seems to be Arsenic Poisoning, making him unable to present his sons to the general body of the church for a vote. Some think Young became too greedy with dynastic intents and was compromised. Today the church still claims Brigham Young died of a ruptured appendix. Samuel W. Taylor, grandson of John Taylor (LDS Prophet) researched this case in depth with a handful of physicians and concluded in a 1996 presentation that Brigham Young was, in fact, assassinated with poison. More here. Church Historian B.H. Roberts Approaches Q12 with Problems in the Book of Mormon. Gets Shut Down. Around 1921, B.H. Roberts, an early church leader and historian, approaches the Quorum of the 12 with problems in the Book of Mormon, and draws many parallels with the book View of the Hebrews, suggesting the Book of Mormon was not divine. He asks that, through revelation, could they provide answers. B.H.Roberts was one of the Presidents of the Quourm of the 70s, wrote a six-volume History of the Church of Jesus Christ of LDS, and was Assistant Church Historian from 1902-1933. The Quorum of the 12 Apostles and the prophet Heber J. Grant tell B.H. Roberts they have no answers, but instead share their testimonies that they know the church is true, and the Book of Mormon was translated by the hand of God. Joseph Fielding Smith Finds and Hides Conflicting First Vision Account. Joseph Fielding Smith, church historian who later became the 10th president of the church, is going through boxes of records carried across the plains from Nauvoo and reads the 1832 account of the First Vision written by Joseph Smith in his own journal. The account mentions him seeing Jesus, but has no mention of another personage. In fact, it refers to Jesus as the Eternal God, contradicting the prevalant storyline of him seeing Jesus, and God the Father as two separate beings. Joseph Fielding Smith tears out the three pages in the journal and hides them in his personal safe for 30 years. At some point Levi Young, senior President of the First Council of the Seventy, got access to the vault and saw these pages. He was told not to copy or tell anyone about them, but in an interview on Feb 3, 1953 he did. He mentioned them to LaMar Petersen, an LDS historian, and then promptly made LaMar promise to tell no one. After Levi Young died in 1963, Peterson told Jerald and Sandra Tanner, who promptly wrote a letter to Joseph Fielding Smith asking to see the journal and pages. In 1965 Paul R. Cheeseman was granted access to the journal, which by now had the three pages taped back in the book. He published his findings in 1965. This early conflicting account of the First Vision, written by Joseph Smith himself, was hidden by church leaders, and was only mentioned publically the first time in a 1970 Improvement Era article. The Church Changes the Book of Mormon, Changing the Nature of God. The original edition of the book of Mormon, the "most correct of any book on Earth," contained many passages stating that Jesus was the Eternal God. This wording appeared in the introduction, in Nephi's dream in 1 Nephi, in Abinadi's speech, in King Lamoni's account, and when Jesus appeared to the people. The introduction, and Nephi's dream were changed in a later printing of the Book of Mormon to say Jesus was the son of the Eternal God. For some reason the other three accounts were not altered. Note that these changes were made in sync with the changes regarding the nature of God in the various versions of the First Vision. Fawn Brodie Gets Exclusive Access to Locked Away Church Archives. Gets Excommunicated. Fawn Mckay Brodie was a world-class biographer, writing biographies of Thomas Jefferson, and Richard Nixon. Being the niece of David O. McKay, she requested access through him to all of the church archives, without restriction, and got it. She researched and in 1945 published the book Joseph Smith: No Man Knows My History exposing polygamy and many other hidden practices and inconsistencies from the early church. She was excommunicated for publishing the book. In the 1970's the Church sends Archaeologist down to Central/South America to locate evidence for the Book of Mormon. He returns with nothing. Quits Church. The church commissions archaeologist Thomas Stuart Ferguson, an LDS archaeologist, to travel to Central and South America and find evidences for the Book of Mormon. After finding nothing conclusive, he quit Mormonism, writing a 29 page paper in 1975 stating he had wasted 25 years of his life trying to prove the Book of Mormon was real. Other LDS archaeologists, such as Dee F. Green also agree there is no remarkable evidence supporting the Book of Mormon, and most of it in fact, contradicts the book. The governing leadership of the church today is paid by the church, while the 15,000,000 members pay into the church. Like Communism, the governing party is the place to be. You can only join the elite governing body by invitation, as they claim to have been chosen in The Grand Council in Heaven in the pre-exhistense. Most Mormons are unaware that the governing leaders of the Mormon church are mostly related to each other and primarily the descendants of the Joseph Smith and Brigham Young family lines. The Mormon church builds a 1.5 Billion dollar shopping mall in downtown Salt Lake City. Modern DNA technology concludes the people of Central and South America are descendants from Mongolia, Australia, and Asia, not the Middle East. Church Changes BofM Introduction again, Deluding "Lamanite" Ancestors. In 2006 the church altered the introduction of the Book of Mormon, yet again. It used to read: "were destroyed, except the Lamanites, and they were the principal ancestors of the American Indians." Now it reads, "were destroyed, except the Lamanites, and they are among the ancestors of the American Indians." Church gives $40 Million of it's estimated $8 Billion tithing income annually to help needy. The church claims to give about $40 Million per year on average to help the needy. The church is estimated (conservatively) to receive about $8 Billion annually in tithing proceeds. This translates into .005% of tithing proceeds actually going to help anybody. So, if you give the church $10,000 a year, the church is using $50 of that to help others. To contrast, WalMart gives more money to help the needy than the Mormon Church. It gave $301 million in donations to charity in 2016. It's difficult to be completely sure because the church hasn't disclosed any financial statements since a 1959 deficit spending fiasco and massive investment losses shook the testimonies of many saints. More here.